This is my day off. Notice I'm being singular not plural. Last Tuesday was also my day off. I have split days off this week because I needed to attend a meeting. I'm not wild about meetings. I really hate split days off. I like to have 2 sequential days off. They don't need to be Saturday and Sunday. Tuesday and Wednesday would be nice. Having off a Wednesday and Thursday would be just as nice. I never get off on Monday unless I put in a request. Monday's are meeting days. We go over numbers, figures, profitability. We do reports, provide answers and solve problems on Mondays. When I have consecutive days off I always spend the first doing all of the housework, that leaves me one full day to do what ever I want. Sometimes I sleep, sometimes I visit with friends, sometimes I take the dogs for a walk (they love the park). Split days screw that up totally. I end up doing housework on both days, which means there is less time for anything else. 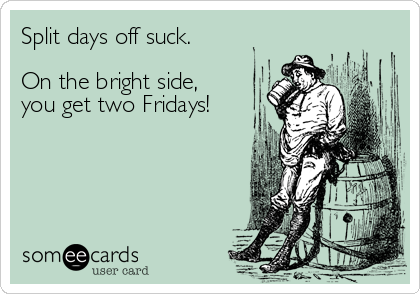 And while some may thing they're getting two Fridays, I know better than that. On the brighter side I'm enjoying the Republican Karma. Obama might have had to deal with the Birthers, but DT will be facing all of those angry people who think he's a Russkie Proxy. What an idiot. And, of course, all of those Trumplodites will hating the fact that they just might have put a Commie in the White House. Stupid is as Stupid does.